Following the fast growing technology, almost people from all around the world are so familiar with VoIP and Intant Messenging Applications. Generally, their main functions are chatting, sharing photos and making phone calls. The best part of using these applications is that most of them are free, although users are very much far from each other, they can share things and make calls instantly. However, they have been interested in creating new and cool things recently which means they have been loving making prank calls and using fake voices to have fun with each other. As the result, AV Voice Changer Software Diamond was introduced to satisfy their demand. 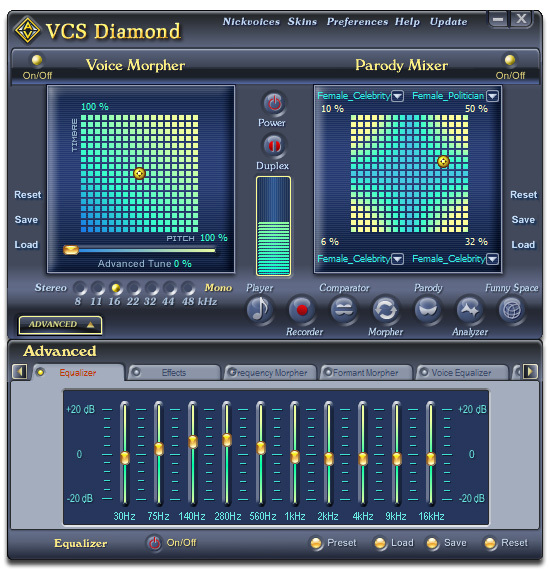 AV Voice Changer Software Diamond is an Audio4fun’s smart voice adjusting tool which adapts to every online or offline voice changing purpose. It includes two substitutive working methods of processing audio streams: the hooking method and the virtual audio driver method, which give the program the ability to capture several audio streams from different applications at the same time and change voices in real-time. It works well with many VoIP and Instant Messaging programs such as Skype, Ventrilo, TeamSpeak, Yahoo Messenger, MSN Live Messenger, AIM, XFire, GoogleTalk, Roger Wilco, Net2Phone, and can be used with all online games including Second Life, World of Warcraft, EVE Online, Lord of the Rings Online, Everquest, Counter-Strike, Battlefield 2, ect. This voice changing tool has a friendly and easy-to-use interface so that it is very easy for users to manage. By moving the cursor on the Dimension graph, you can sound younger, older, more feminine or even more masculine. For lazy people like me, you can take advantage of the ready-to-use nickvoice store which has a variety of choices for you. Nickvoice is the preset combination setting of voice's pitch and timbre, there are voices of politician, teacher, lovely voices, animal sounds and even famous celebrities' voices. AV Voice Changer Software Diamond deserves to be called magic to people who love creativity and innovation. This tools is the most amazing software I have ever discovered and trust me, it is definitely worth a try. For more information about their products, you can visit Audio4fun's website and get yourself a copy of this software here. Remember, you can change your voice but your personality, always be yourself and have fun!